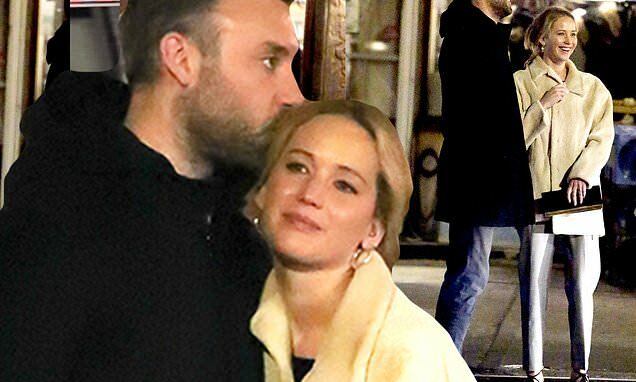 And the love is clearly strong between Jennifer Lawrence and her fiance Cooke Maroney, as the two demonstrated on a romantic date night on Saturday. After a sushi dinner, the couple were pictured chatting animatedly in the New York street, wide smiles on their faces, before Cooke sweetly planted a loving kiss on his bride-to-be's head. The Oscar-winning actress, 28, smiled as he did so, holding her purse in front of her, showing off her glittering diamond ring as she did so. The two had been for a sushi meal, with Jennifer wearing a warm fur coat and taper cigar pants. The Silver Linings Playbook star and art gallery director Cooke, 34, had been dating for eight months when he got down on one knee and popped the question last month.